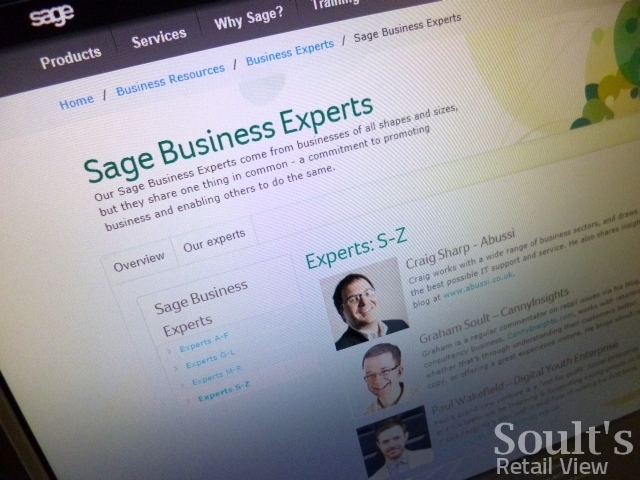 As you may have seen already, I was recently recruited as a Business Expert by the well-known Newcastle-based business software and services provider Sage. Set up towards the end of last year, the aim of the new group is to support and advise the UK business community via social media, drawing together Business Experts who “share a commitment to promoting business and enabling others to do the same.” It’s an unpaid role, and there’s no requirement for me to start plugging Sage all of a sudden, but the main thing is that it’s a great platform both for celebrating business and for championing the issues that are important to the retail sector. In previous Sage blogs, I’ve already highlighted the industry campaign to freeze business rates at a time when high-street retailers are under immense pressure, and urged businesses to ‘MOT’ their websites as one of their New Year resolutions for 2013. 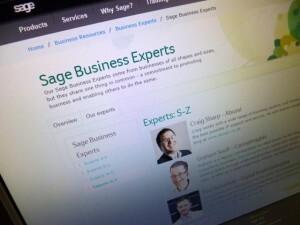 Most recently, Sage asked if I could provide some tips – in no more than 500 words – on setting up a retail business, highlights of which were published on the Sage Blog yesterday. 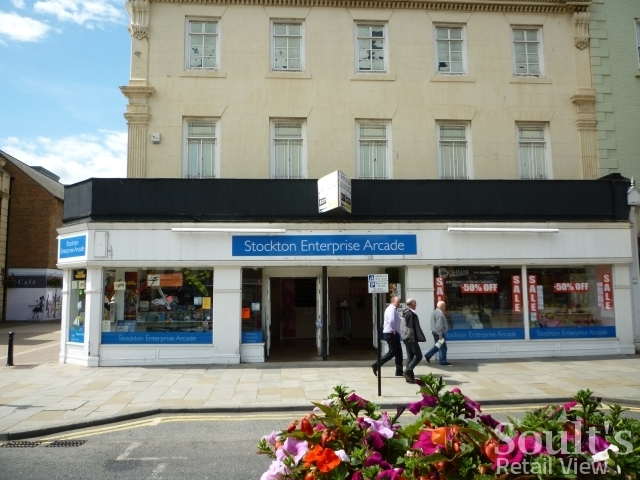 Given all that’s involved in opening a shop – from finding premises to buying stock and dealing with customers – it was a bit of a tall order, but I thought I’d focus on those aspects of business that I tend to talk and write about the most: online marketing and the customer experience. Every business needs a USP, and retail is no exception – shops that thrive are those that offer a distinctive experience, with brilliant customer service and products that people want. Before jumping in, consider the market for the products that you want to sell. Who will the customer be? Where will they expect to buy your products – on the high street, online, or both? And who is your competition? Once you’ve thought about your route to market, test your idea to see how it works. Contrary to what you might think, growing numbers of today’s high street independents began as online businesses. Setting up a basic online store can be a low-risk and low-cost way of seeing whether customers love your products – before you give up the day job. While retail businesses can thrive exclusively online, many aspiring retailers still want the thrill and buzz of a physical shop – showcasing their creativity through their store interior and merchandising, and enjoying building face-to-face relationships with their customers. Indeed, recent research by Sage revealed that one in five of those planning on starting a business intended to open a physical shop in the next two years. Similarly, recent figures from the Local Data Company showed that during the first half of 2012, the number of independent shops trading in Britain’s top 500 towns grew by 800 – helping offset store closures by big chains – as more and more budding shopkeepers set up on their own. Again, don’t feel you have to make a long-term commitment straight away. In the current downturn, pop-up shops have become a popular way of testing retail concepts, and landlords are increasingly open to ideas that will avoid their properties sitting empty. Market stalls are also a quick and low-cost way of getting your retail business out there on the high street. 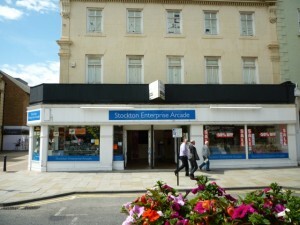 Alternatively, see whether your local authority has set up an Enterprise Arcade, like the one in Stockton, above – a high-street incubator for retail start-ups, typically with six months’ free rent alongside business development and marketing support. Once you’re up and running, it’s crucial to keep driving shoppers to your premises or website, and this is where online marketing can be a great help. Used well – in an engaging rather than a salesy way – free tools like Twitter, Facebook or YouTube can be a fantastic means of showcasing your shop, building awareness, promoting word of mouth, and encouraging visits – all important ingredients in developing long-term success. And that’s my 500 words used up… my fellow Sage Business Expert Rachel Parkin shared some great additional tips on opening a retail store in another Sage Blog last week, highlighting issues around location, external appearance, signage and engaging the senses, but what would be your top tips for anyone looking to open a shop? As always, feel free to share your own ideas below. My retail consultancy business, CannyInsights.com, helps retailers with many of the tasks highlighted in this blog post, including providing market insight, critiquing websites’ appearance and usability, creating and improving web content, and helping businesses get to grips with social media. For more information on how CannyInsights.com can support your business, visit www.cannyinsights.com, drop me an email, or give me a call on (0191) 461 0361. As eight Midlands Co-op department stores face closure, what might the future hold?